In the reference 4th read above, Government have issued orders pursuant to the Sports Policy declared in G.O.Ms.No.84, Youth Advancement, Tourism and Culture (Sports) Department, dated:4.5.2000, wherein orders were issued extending two percent (2%) Sports reservation in future direct recruitment to various posts in Government at all levels. The guidelines required were also issued governing such appointments. In the reference 5th read above, the Secretary, the then Andhra Pradesh Public Service Commission, Hyderabad has informed that, since vertical reservations are already provided up to 50% to the social categories i.e., SCs, STs, BCs, the Commission is of the opinion that reservation to Sports persons should be horizontal but not vertical. 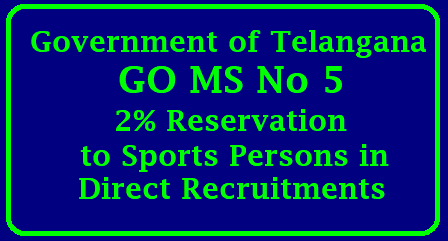 In the reference 9th read above, the Secretary, Telangana State Public Service Commission has stated that, provision of 2% reservation for meritorious sports persons in direct recruitments was not possible unless and until amendments were issued to the Rule 22 of Andhra Pradesh State and Subordinate Service Rules, 1996. (xvii) of the G.O.Ms.No.74, YAT&C(Sports) Department, dated:9.8.2012, accordingly. The G.A. (Services-D) Department has advised to examine the issue on the afore said lines and take a decision in the matter. The Government after careful examination of the matter have decided to make necessary amendment to the said G.O. and hereby issue the following amendment to G.O.Ms.No.74, YAT&C(Sports) Department, dated:9.8.2012. The Governor of Telangana hereby makes the following amendment to G.O.Ms.No.74, YAT&C(Sports) Department, dated:9.8.2012. In the said guidelines issued in G.O.Ms.No.74, YAT&C(Sports) Department, dated:9.8.2012 for existing clause No. (xvii) the following shall be substituted, namely. (xvii) Provide 2% reservations to meritorious sportsperson horizontally in Direct recruitment in the existing 100 roster points as per Rule-22(2)(e) of the T.S and Subordinate Service Rules, 1996, 48th and 98th points meant for open competition shall be earmarked to reservation under Sports Quota in Direct recruitment and the said reservation shall be horizontal. Further, in the event of Non availability of eligible sportspersons, the points reserved for them should be deemed to be ceased and allotted to open competition in the same recruitment. The other term and conditions stipulated in G.O.Ms.No.74, YAT&C(Sports) Department, dated:9.8.2012 shall remain unaltered. The General Administration (Services-D) Department shall issue necessary amendments to the Telangana State and Subordinate Service Rules (1996) accordingly. All the Departments of Secretariat, Heads of Departments and all officers concerned are requested to implement the above orders with immediate effect.